It was a beautiful spring evening, and my boss asked me to suggest a place for a farewell drink for a departing colleague. 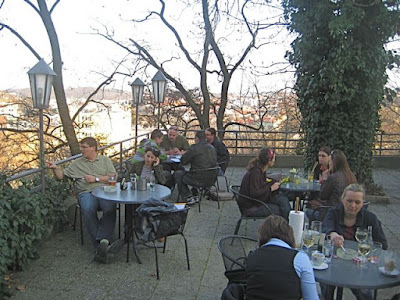 He had two conditions: We should be able to sit outside to enjoy the warm weather and it should be relatively close to Wenceslas Square. 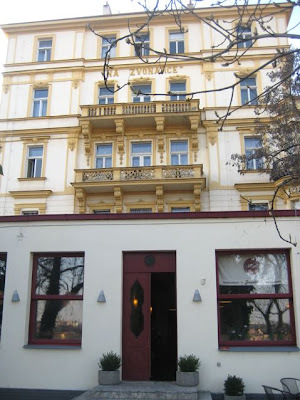 A colleague had already called Restaurace Mušketýr, and it was booked. I knew Bredovský dvůr would be, as well. I thought Riegrovy sady beer garden wasn't appropriate. In the end, I came up with Restaurace Zvonařka. The place is known for its large terrace, if not for its food. And I was correct in my assumption that the terrace would not be full. It's a nice spot, but often overlooked. In past summers, they fired up a grill outside, but it was too early in the season for that. The word "zvonařka" is somewhat hard to define in modern usage. I was told by someone with a degree in Czech linguistics that it means something like "bell foundry" or a place for bells. The restaurant sits on the edge of a hill. 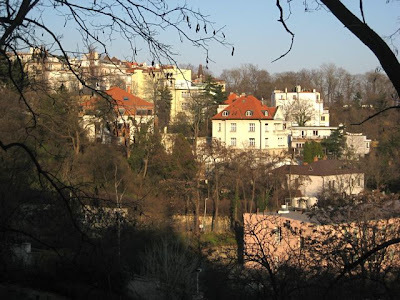 On one side, there is a view of the rich villas of Vinohrady. 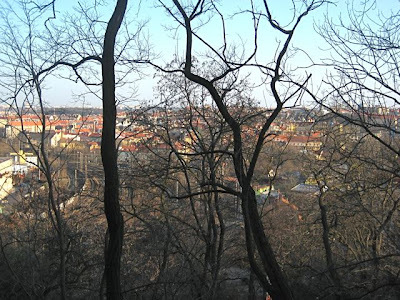 And on the other side, there is a view of the train tracks of Vršovice and the lesser environs of Nusle. When the leaves really come out, you see a lot less. 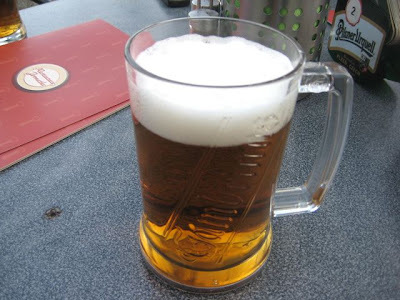 I had a half-liter of Gambrinus (29 CZK). 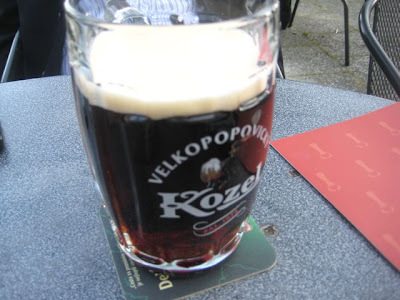 Someone else drank Kozel dark (35 CZK). Pilsner Urquell is also available (35 CZK). 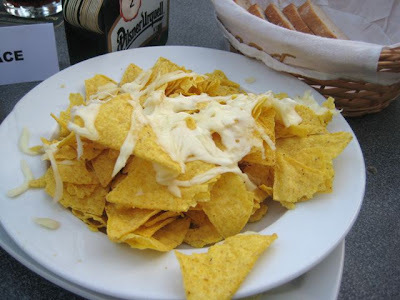 We ordered a round of cheese nachos (90 CZK) for the table. These were quite bad. The very ordinary chips were covered with melted cheese that quickly cooled and hardened. Trying to pick up one chip often resulted in picking up 13 others that were stuck together. You had to peel the chips apart from the cheese. Very awkward. The salsa was some sweet stuff from a jar. Pretty standard in Prague. 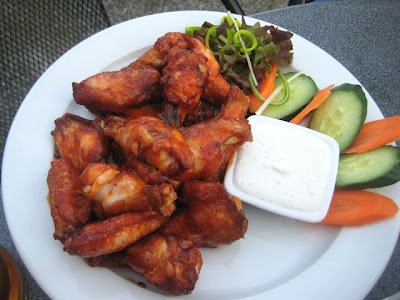 We ordered a few rounds of the large plate of 16 chicken wings with Buffalo sauce (150 CZK). These were very good. They were large, cooked just right, and I liked the sauce. It was sweeter than a classic American Buffalo sauce, but still had a nice tang. I ate many of these. Later, we ordered a round with barbecue sauce, but the sauce was exactly the same. We weren't sure if we had gotten the wrong sauce the first time or the second time. We didn't bother to ask because the service was not very good on the terrace, and we had a hard enough time just getting an order in. There are two large rooms inside. I had a big birthday party there a few years ago. They were very cool about giving me one of the rooms, without guaranteed minimum charge for the house. I just ordered a modest amount of food in advance and brought a lot of thirsty people, and they were happy. I don't know whether that deal is still available. 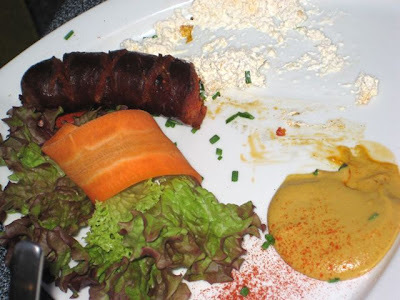 On this visit, we also ordered a few spicy klobasy or sausages (75 CZK each). They were quite popular at the table, so I had a hard time getting a picture before they had succumbed to knives and forks. They came with bread, mustard and horseradish. I thought they were a bit on the dry side, but not too fatty and quite tasty. So, if you are looking for a place to hang out in good weather, maybe have some good wings, and can't think of where to go, perhaps Zvonařka will ring a bell. Slow service outdoor is something that plagues many a Czech restaurant and pub, it seems that onwers "forget" that they will need more servers to take care of the extra clients. Just going by the Internet menu, but Kozel was 35 CZK. Now, 90 CZK for those gloppy chips -- that was bad! Do they still have the thai stuff on the menu? A year or two ago I remember eating a reasonably good pad thai at zvonarka... Can't see it on their website now, don't wanna waste a trip.